Mushrooms are neither fruit or vegetable which means they have a very unique nutritional profile! Adding some mushrooms to your diet is an easy way to boost Vitamin D (amazing for healthy bone and muscles), Vitamin B (essential for healthy nerve function) and folate (needed for cell division). Plus they taste so delicious – this is comfort food at it’s best! Serve with sustainably sourced red meat if you choose, or my Lemon & Herb Chicken. Chop button mushrooms into quarters. Finely slice garlic clove. Heat 1 tbsp olive oil in a non-stick pan on medium-heat. Add chopped garlic clove to pan and sauté for 2-3 minutes, until golden and fragrant. 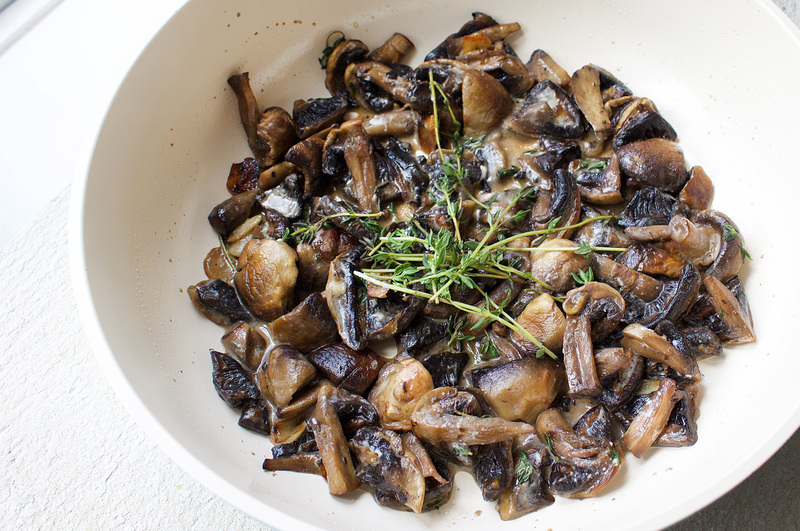 Add mushrooms to pan and sauté for another 3-5 minutes, until cooked. Season generously with sea salt and sprinkle over thyme leaves. Once mushrooms are wilted and cooked, add coconut milk and sauté for one more minute, until coconut milk has slightly evaporated. Sprinkle with extra thyme sprigs and serve. My 8-week online Program is full of delicious and nutritious recipes, just like this! Check it out here.